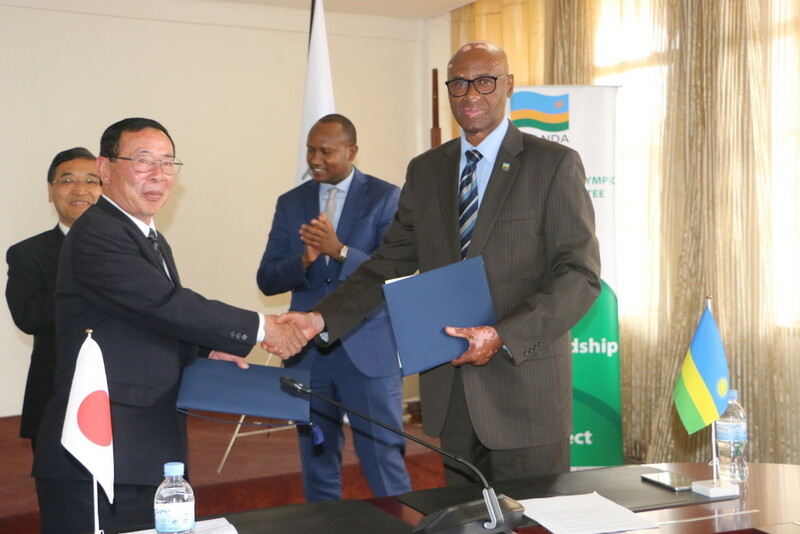 A Memorandum of Understanding (MoU) has been signed by the Rwanda Olympic Committee and the Japanese City of Hachimantai-which will allow the former to use sports facilities in build-up to the Tokyo 2020 Olympic Games. The signing ceremony took place on Tuesday, May 15, 2018, at the Ministry of Sports and Culture in Remera, Kigali City. According to Rwanda Olympic Committee, the agreement covers the provision of and access to facilities for the Rwanda Olympic team. The Ambassador of Japan in Rwanda, His Excellency Takayuki Miyashita and the Permanent Secretary in the Ministry of Sports and Culture, John Ntigengwa are among dignitaries who attended the signing ceremony. Both Hachimantai City and the Rwanda Olympic Committee agreed to work cooperatively on the Rwandan Olympic athletes’ training camp and to implement mutually, beneficial projects so that the Rwandan athletes can perform in the best possible way during the 2020 Tokyo Olympic Games. Speaking at the ceremony, RNOSC President, Amb. Valens Munyabagisha said that the program started about five months ago and managed to pay a visit to Hachamantai City in March 2018. During the visit, the Amb. Munyabagisha had a fruitful exchange with the Mayor of the City and took a look on the good sports and accommodation facilities which will play host to the Rwandan athletes during their stay in Hachimantai City. “We have agreed with Hachimantai City to take care of the expenses including accommodation, feeding, as well as provide training facilities for the Rwanda Olympic Team before and during the Tokyo 2020 Olympics. RNOSC will take care of travel expenses from Rwanda to Japan and the health insurances for the athletes,” Amb. Munyabagisha was quoted. His Excellency Takayuki Miyashita, Ambassador of Japan to Rwanda who also witnessed the signing of the MoU noted that his mission was to oversee that government to government cooperation continues to develop far. “People to People relations is also good when it is strengthened, both parties will meet to exchange strengthen cooperation to promote more between Rwanda and Japan. I will be in the Hachimantai City to fully support Team Rwanda and I wish them to win many Olympic medals,” H.E. Takayuki explained. The Permanent Secretary, Ntigengwa said that signing the MoU was an added value to the existing relations and partnership between Rwanda and Japan. Japan has made an immeasurable contribution to the Olympic Movement. Tokyo 1964, Sapporo 1972 and Nagano 1998 provided the stage for some of the most memorable Olympic moments. The Tokyo 2020 Olympic Games will take place from July 24 to August 9.